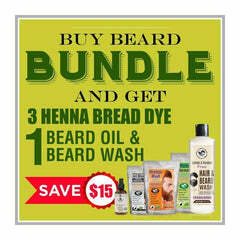 All natural bundle of hair & beard dye for men. Includes great collection of natural & organic products for men with sensitive skin or someone who is willing to switch to natural alternatives. Since this package is offered with heavy discounts, it is only available on subscription. Minimum 6 orders will be required for this subscription.You have an option to choose frequency of delivery. This beard bundle kit is all that I needed for a healthy and shiny beard. It included everything needed. I am using Henna hair care and beard products for over 5 months and these are simply the best.